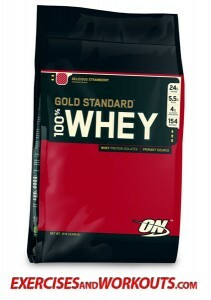 Optimum Nutrition produces one of the finest whey protein products I have ever used. Not only is it effective for your muscle building goals but, pound for pound, it is the most cost efficient. If you are an avid protein user then there is no need to mention that 100% whey protein is the best choice. If you are looking for an “all in one” workout supplement then this is not your best bet. Ideally you would want to use Gold Standard whey protein in conjunction with your favorite pre-workout drink, like USPLabs Jack3d or BSN NO Xplode. Additionally, if you are trying to gain weight use whey protein with your already existing, high-calorie, diet. Taking a protein supplement may curve your appetite, so asses your unique goals and use this supplement appropriately. This entry was posted in Bodybuilding, Supplement Review and tagged Optimum Nutrition, Whey Protein by Russell Jensen. Bookmark the permalink.